We walked into our living room at the creek and found these ants clustered around a small black fragment. We were conflicted by the problem of "securing our border" (i.e. the front door sill) while removing the ant migrants safely. We tried brushing them, considered baiting and finally used extreme measures on the remaining few while two escaped under the sofa. 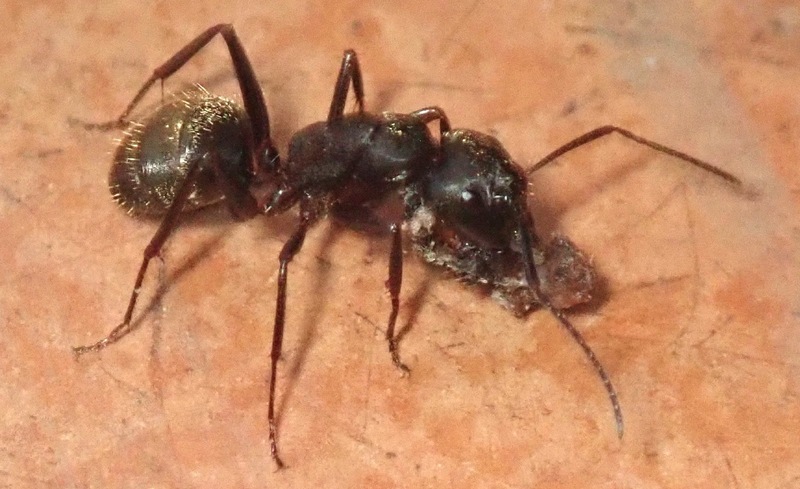 James Trager identified the ants as eastern black carpenter ants Camponotus pennsylvanicus. Its claim to fame is that it was the first North American ant to be described. 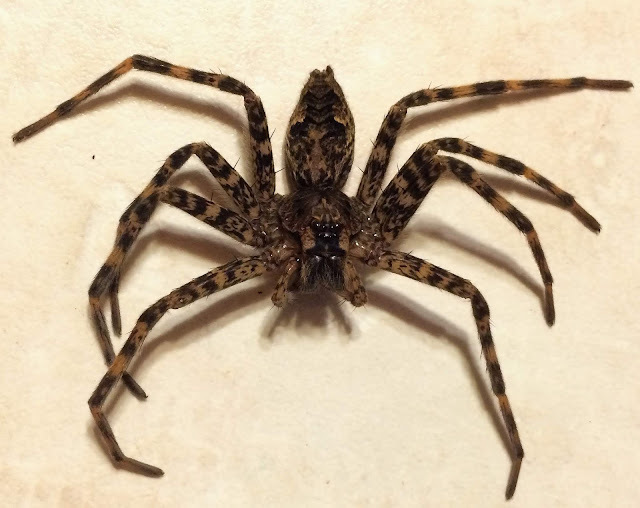 It is ubiquitous east of the Rockies and can be very destructive when out of its natural woodland habitat, chewing wood in our structures. They only eat dead wood that has some degree of softening by rot. 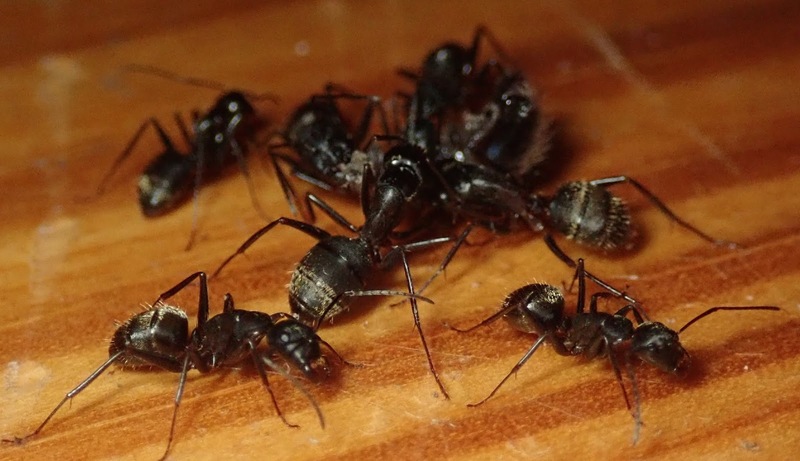 Ants might argue that they were here long before we were and the conflict comes from humans and their wood dwellings that have encroached on the ants' territory. Now we are concerned about those two ants that are isolated and lonely under the sofa. There is scientific evidence in this study that a related species, Camponotus fellah, have a shortened life span when they are isolated and presumably depressed. Isolated ants lived only six days, whereas group-living ants lived up to ten times as long (averaging 66 days of life). I tentatively identified the fragment of the ants' victim as remains of a Dolmedes sp spider. 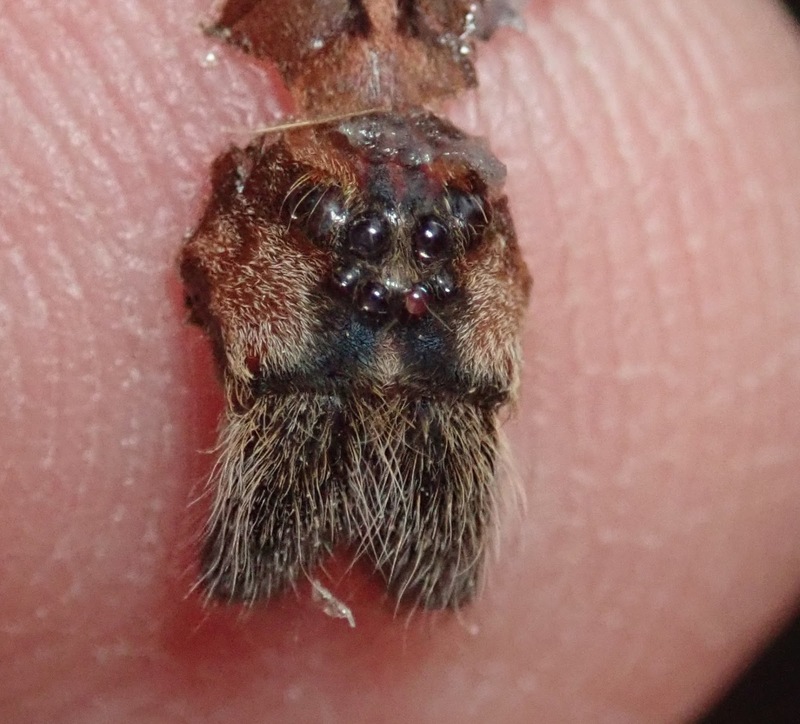 The eye arrangement is distinctive with the lower four eyes curving upward like a smile, unlike the frown of other members of the Pisauridae family of nursery web spiders. They are so named because they carry their egg sacs in their jaws. Coincidentally, James reminded me that he had previously shared the photograph above with me, taken in our cabin! "By the way, I took pictures a live Dolomedes tenebrosus when I was in your cabin. They like the moist woods and riparian sites, and hang out on tree trunks looking like bark. I’ve never found one at the actual water’s edge, where related Pisaurina mira lives." Meanwhile, I considered forming a support group for the lonely and starving pair of ants under the couch but Barb has convinced me that I am suffering from excessive anthropomorphic thoughts. If they emerge they will likely be euthanized with her finger. * Social isolation causes mortality by disrupting energy homeostasis in ants.